McMenamins Edgefield could easily be described as an “Adult Disney”. Built in 1911 as the county poor farm, this historic spot now offers unique resort lodging and venue options on its vast 74 acres. There’s a brewery, winery, distillery, golf, full-service spa, movie theater, delicious dining options, and more, all within a leisurely stroll. Combining the Pacific Northwest beauty with McMenamins’ charm, this is a wedding venue – and an experience – that you and your guests are sure to never forget! Nearby the Columbia River Gorge National Scenic Area, Edgefield is conveniently located just 15 minutes away by car from the Portland International Airport, and 20 minutes away from downtown Portland. The main building offers over 100 on-site guestrooms and hostel accommodations, and is furnished in cozy décor. 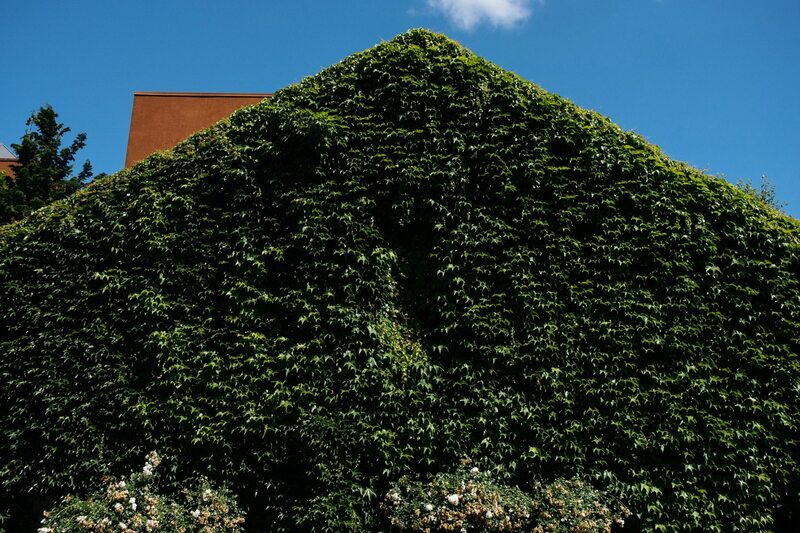 Cynthia Major, an Event Planner and Coordinator at McMenamins, explained as she gave us a tour, “Pre-welfare, when this space functioned as a Poor Farm, these hotel rooms served as lodging for the homeless, who would work on the farms”. The rooms, each different in their own way, have vintage furnishings, and most have unique hand-painted murals on walls. Rooms come sans phones or televisions, encouraging tranquility and making good ol’ fashioned connection with others a priority for your guests. What makes it an ideal wedding venue in Portland? 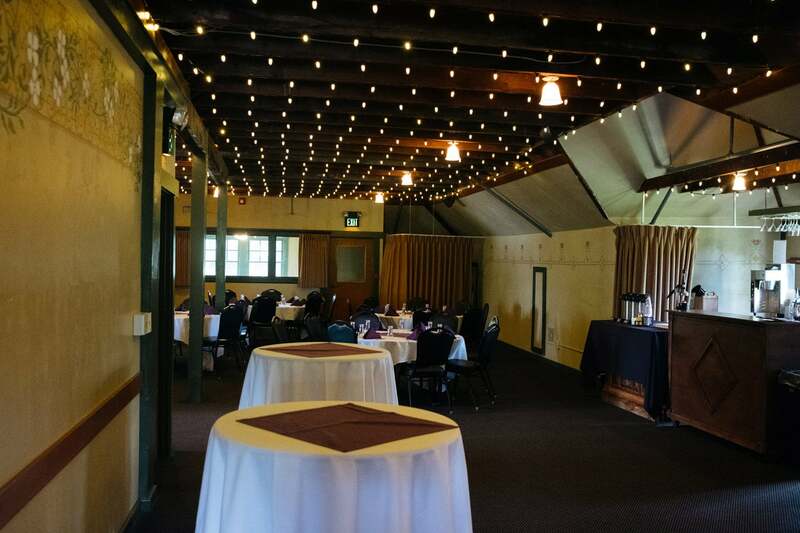 McMenamins Edgefield offers a wide variety of event spaces and meeting rooms, both indoor and outdoor, on their gorgeous estate. Onsite catering, staff, and a bakery led by an award-winning pastry chef make planning easy. 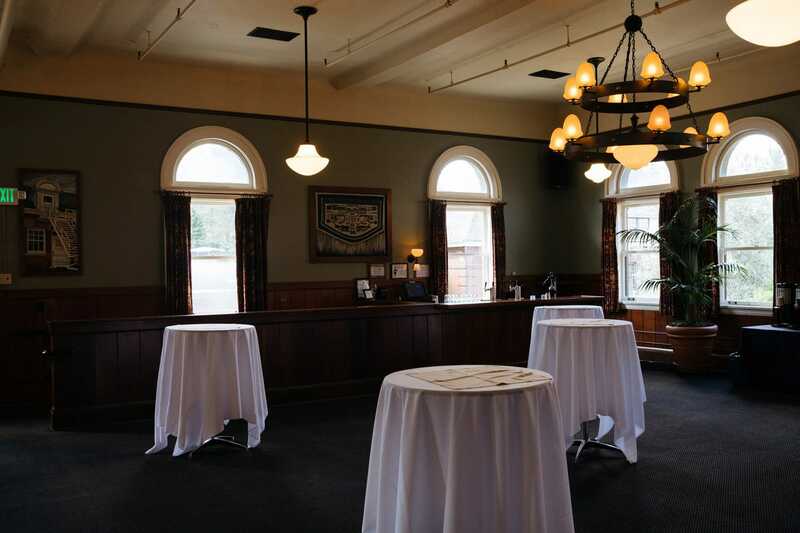 Plus, you can utilize all McMenamins has to offer for refreshments on your big day – handcrafted ales, wines, ciders, coffee and spirits – all on site! Some highlights from our tour include The Administrative House – a six guestroom, three story home that can be rented out by a wedding party, and includes use of the Administrator’s House Yard – which can accommodate up to 100 people. The maroon brick ground, contrasted with the surrounding lush trees and greenery make for a dazzling “backyard feel” outdoor scene. The Ballroom is another popular area to host a cocktail hour or reception. Originally both the chapel and recreation room during the Poor Farm era and located within the “Main Lodge”, the Ballroom’s forest green walls and wood accents make it a warm and inviting space. 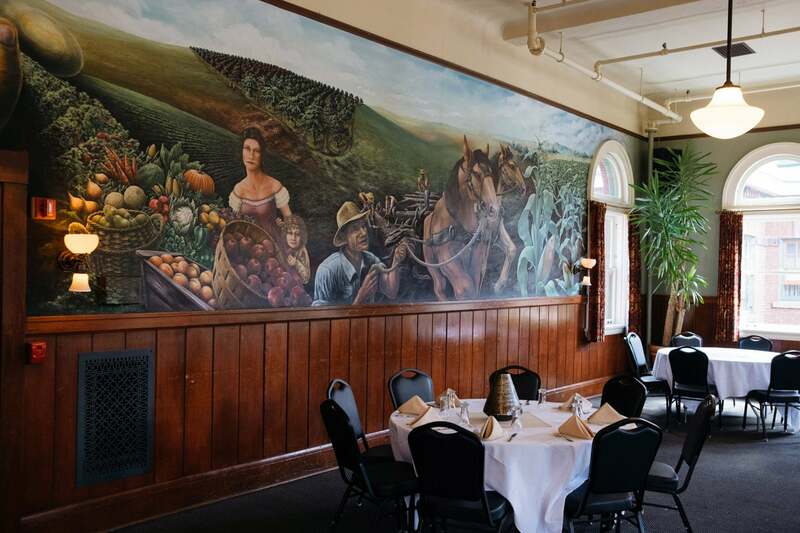 On one of the walls is a hand painted mural with vast green fields of a farmland, bountiful produce from a successful harvest, horses and a few figures, adding character to the room. Farmhouse style chandeliers with bell shaped lights and many narrow windows with sphere shaped tops provide plenty of lighting to the room, which can accommodate up to 128 people. The Attic is a cushy room ideal for receptions, beautifully lit with alcoves on each side of the room and darling string lights hanging from the beams of the ceiling. With a capacity of up to 100 people, the open beams and hardwood floors pair well to create a vintage-vibe that feels spacious yet cozy at the same time. 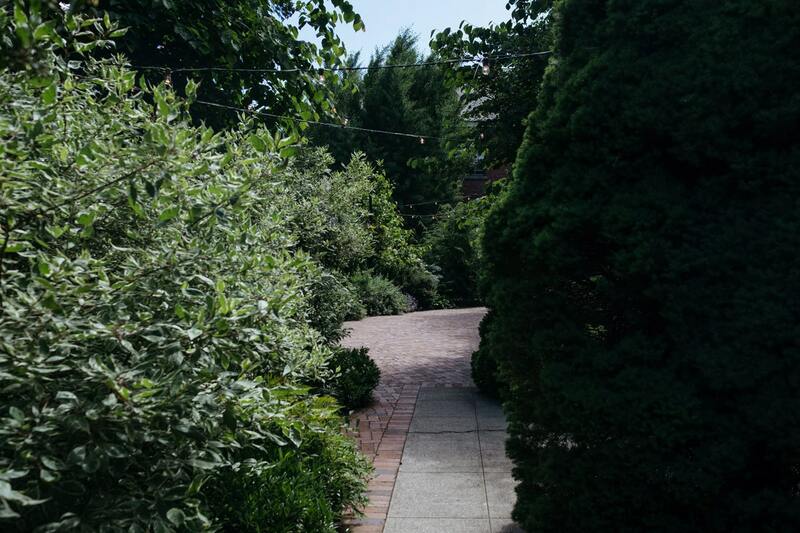 Whether you’re looking for a small wedding venue or large, the Edgefield “grounds” can be a the perfect destination wedding venue that can provide the space you need. Your loved ones can spend time exploring the Edgefield estate during their visit – wander the gardens with a drink, gander at the artwork, visit the onsite glass-blower and potter, or catch some live music in the Amphitheater in the summer months. It’s the perfect scene for guests to participate in some fun and relaxation during your special event. McMenamins Edgefield is a whimsical land that offers all an adult could dream of, in one spot! It seems as though having your wedding venue here would be like booking a destination wedding…without much of the destination “logistical” hassle. You and your guests get to experience this communal paradise together.